Computer-supported collaborative learning (CSCL) environments may help encourage learners to engage in argumentative knowledge construction. Argumentative knowledge construction means that learners work together to elaborate on concepts by constructing arguments and counterarguments. This is achieved through discourse with the goal of acquiring knowledge within a specific domain. However, learners may encounter problems relating to one of three dimensions of argumentative knowledge construction. First, learners seem to have difficulties in constructing arguments that contribute to solving the task. Second, learners’ arguments may lack important components such as data and warrants. Third, learners rarely build upon the arguments of their learning partners. 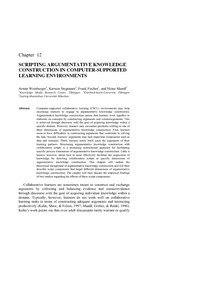 Structuring argumentative knowledge construction with collaboration scripts is a promising instructional approach for facilitating specific process dimensions of argumentative knowledge construction. Little is known, however, about how to most effectively facilitate the acquisition of knowledge by directing collaboration scripts at specific dimensions of argumentative knowledge construction. This chapter will outline the theoretical background of argumentative knowledge construction and will then describe script components that target different dimensions of argumentative knowledge construction. The chapter will then discuss the empirical findings of two studies regarding the effects of these script components.